Timber Preserver gives timber protection against fungal degrade and some species of woodborers. 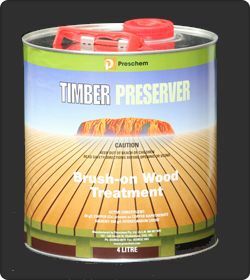 Timber Preserver is a registered wood preservative with the APVMA. Timber Preserver weathers to a subtle brown colour on most timbers providing a more natural look. Timber Preserver also contains an oil which provides the timber water repellency. For use in areas such as deck subframes, crossarms, timber fencing, sleepers, timber decking and bearers, timber joints of all kinds and situations where damp conditions could promote decay or other biological attack. Timber Preserver can be applied by any convenient means such as brush, roller, spray or even dip application. Best results are obtained with the application of two (2) flood coats. For remedial treatment, it is essential that all decayed wood be removed from the timber surface prior to the application of the Timber Preserver. Clean up equipment with mineral turpentine. Painting over Timber Preserver is only recommended with oil based paints. Builders “filler” products will adhere to Timber Preserver provided sufficient drying time has been allowed. 6-8 square metres per litre. May irritate the eyes and skin. Avoid contact with the eyes and skin. Wash hands after use. If poisoning occurs contact a Doctor of Poisons Information Centre (13 11 26). If painting is necessary a post-treatment during period of at least 3 weeks should be allowed. Use only oil based paints or stains. Avoid light colours, as the oil will discolour them. Compatible with most common metals and plastics.